You may love your cat, but a cat peeing on couch can be every cat parent’s nightmare because cat pee is extremely difficult to remove from fabric. Cat pee also has a very strong smell as it dries, and this odor turns into a strong ammonia scent that gets stronger as the bacteria continues to thrive. We’re going to outline several possible reasons why your cat may start peeing on your couch or furniture. Additionally, we’ll give you several things you can do to try and stop your cat from peeing on your couch once you manage to get it clean. There are several reasons why your cat count be peeing on your couch, and it may take a few tries before you uncover the real reason. But, you can start to correct it once you find the issue. Cats tend to do best in an environment that has a routine, stability, and not many disruptions or changes to their daily schedule. If you’re working new hours, working longer hours, had a new baby, or introduced a new animal to your house, this can throw off your cat’s normal routine and cause them to do things they normally wouldn’t do. As a result, your cat may start urinating on your furniture, carpets, flooring, rugs, or anything that is slightly off the floor. Even things that may seem insignificant to us could be drastic to your cat, and the response is to trigger this unwanted behavior. We all know that your cat can be a picky thing, and this extends to their litter because you can buy different textures and granule sizes that feel different. Your cat may seem hesitant to use the litter box, or they may avoid it altogether and start soiling your furniture. However, you should notice a change in your cat’s bathroom habits in response to changing or swapping out their litter. Also, if you’ve had your cat declawed, the litter may hurt their feet and make them hesitant to use it at all. Think about your couches, chairs, or lounges and think about what they all have in common that excludes your cat’s litter box. The answer is height. The higher elevation in these areas gives your cat a good view of the entire surrounding room, and it’s harder for anything to sneak up on them. When your cat uses their litter box, they’re closer to the ground and more exposed to any potential threats. This can be especially true if you’ve added a larger animal to the household that your cat may see as a threat. Some cats have no problem sharing a litter box with one or more cats, and other cats will refuse to share a litter box. If you have more than one cat and one litter box, one cat may break away and start to look for other places to go to the bathroom like on your couch or furniture. Generally speaking, the rule of thumb is to have 1.5 litter boxes per cat, per household. So, one cat has two litter boxes, two cats have three litter boxes, three cats have five litter boxes, and so on. Each cat can claim their own. If your cat suddenly starts going to the bathroom where they’re not supposed to go, and you haven’t had any changes to their usual routine, it could be related to a medical reason. A veterinarian can check your cat for things like a urinary tract infection, kidney problems, or diabetes to rule them out. These common health problems can make your cat have to go to the bathroom more throughout the day, and they may not be able to hold it until they reach their litter box. Instead, they could start going to the nearest piece of furniture. When you go to the bathroom, you can privacy and security. Your cat likes these things too when they go to the bathroom, and they may be less inclined to use the litter box if it’s in a high traffic area, tucked into a busy corner of the house, or away from the usual areas of the house your cat frequents. Your cat may start to look for alternate areas to go to the bathroom if their litter box is in an area by a loud appliance, in a dark room, or somewhere that there isn’t an easy escape route. However, it’s relatively easy to move the litter box to a more centralized location. Although you may like the convenience of having a covered litter box that helps to conceal and block odors, it may restrict your cat’s movements and make them hesitant to use it. Also, if your litter box is too small for your cat to easily move around, they may start to avoid it. Your furniture is an ideal place for them to pee because there are no covers to restrict their movement, it’s open with plenty of escape routes, and it’s higher in the air to make them feel more secure. Multiple cat households will have small spats and disputes from time to time, but it can result in each cat trying to carve out a small slice of territory throughout your house. Peeing is one way for your cat to mark items as theirs, especially if they feel threatened by other animals. You may need to step in and gradually reintroduce the cats to one another over several days to help them feel comfortable, and you can give them vertical space to claim. Additionally, scratching posts allow your cat to scent mark places without completely ruining them. Cats may be more solitary animals, but they can get separation anxiety if you leave them alone for extended periods of time every day. This anxiety can cause them to act out and do things that they normally wouldn’t do like pee on your furniture, shred your upholstery, or meow incessantly. If you can’t be home with them more, consider asking a family member or a friend to drop by once a day or so for 15 to 20 minutes and interact with your cat. You can also put articles of your clothing that you wore in areas where your cat hangs out to keep your scent around them. 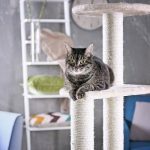 Furniture or Couch Covers – Furniture or couch covers add a layer of protection to your things to make it more difficult for your cat to get to them. Additionally, the pee will soak into the couch cover instead of the couch, and it’s easier to clean and wash.
Litter Test – If you think your litter is the issue, get two litter boxes and put soft litter in one and more rough or textured litter in the other. See which one your cat prefers, and switch their main litter to this type. Medical Treatment – Your veterinarian will be able to prescribe the best treatment plan if your cat has a medical issue that makes them urinate more. This could be anything from antibiotics to ongoing measures to manage their health problem. Litter Box Issues – You may want to consider adding more litter boxes, larger litter boxes, or even switching out the type of litter box for a more open model. If they don’t work out, you can clean them and drop them off at your local humane society. Clean and Spray the Furniture – You want to use an enzymatic cleaner to break down the bacteria in your cat’s urine on your furniture to prevent a lingering odor. Once you clean the area and get rid of the small, spritz citrus scented water or cleaner to ward your cat off because cats are not fond of this smell. Now that we listed several reasons why your cat peeing on couch and how to fix them, you can start trying different methods with your cat to see which one works. It may take a little time, but you’ll end up with a happier cat and mess-free furniture.